We hear a lot about the “delimitiation” or “demarcation” or something of a kind that the Serbs and the Albanians “must do” to resolve the conflict, and it seems like a very, very bad idea for numerous reasons. Let’s see which. Here is a list of some of the flosculi used to justify this terrible idea, and a slow démontage of them. The delimitation between the Serbian and the Albanian lands, even if we make a clear cut of North Kosovo and Bujanovac and Preševo (or parts of these communities) will not prevent the formation of the so-called Greater Albania. The delimitation plan actually perpetuates the idea that everything south of the River Ibar is going to be independent Kosovo, which will immediately become a NATO and UN member. Independent Kosovo (which is a supreme bad idea, we will see why later) will in couple of years be united with Albania. If you think that any promises that it will not happen apply, that goes to show how little you know about the international politics. If there are two sovereign states, they can and should unite. If you still don’t believe it, believe that the border between the two territories will be abolished soon. Any agreements with independent Kosovo would probably last for a few years, then you will have to renegotiate them with the united Albania. No-one can prevent the unification of these countries and no-one should. If you let Kosovo go, you let it. Why do you care about the unification of two foreign countries? Well, this is wrong on so many levels! First of all, it is purely racist. It depicts Albanians as some invasive species which want to invade you, like grasshoppers or rodents. It is the same depiction the ultra-right movements use to justify anti-immigration hatred. And apart from being deeply offensive, presenting Serbs as some kind of “pure species”, it is factually wrong. It could be true in 1989, when the high birthrate was really jeopardizing the balance between the Albanians and neigbouring Slavs, but now, the Serbs in Serbia have the negative birthrate, so are Albanians in Kosovo and Macedonia. The UN claims that Kosovo will have the population of 1,652,090 por 92% of 1,783,531 in 2017. In 2100, Albania will have 2.469.000 (83% of today’s population) and Serbia 6.473.000 (73% compared to today’s number) – some 4.9m without Kosovo – so the number of Serbians and Albanians (Albania and Kosovo united) would be in 6.2 million : 4.6 million in 2050. It means that the Albanians not only have a low birthrate but they are leaving both of these areas. In fact, both Serbia and Kosovo will die out in 2050 without migration. This is what the EU said, and it is obviously a whishful thinking. Maria Zakharova clearly said this “in between the lines” in Belgrade. First, there will be a spillover and instability in Bosnia, Sandžak and Vojvodina, so it is not the final “delimitation of Serbia”, it is just a start. It can also destabilise (North) Macedonia, and the worst is that it will immediately trigger the same reaction in Abkhazia, South Ossetia, Nagorno-Karabakh, Transnistria, Crimea, Northern Cyprus, and perhaps in Gagauzia and Donbass. The Kosovo solution, if Kosovo does become independent after all, in current borders or changed borders, will be a model for all those areas. 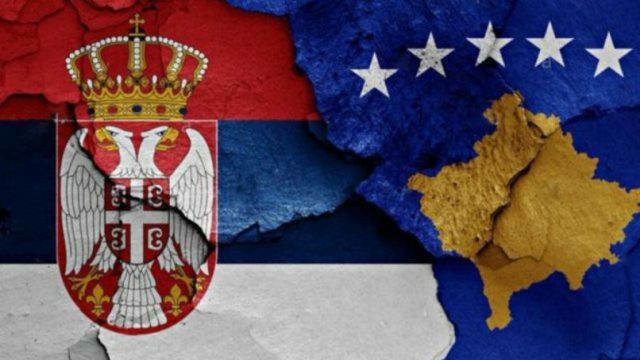 If Serbia recognises any kind of independence with the UN membership, it will irrepairably damage the prospects of peace in many European countries. Not to mention that all the countries we will betray – Georgia, Ukraine, Moldova, Azerbaijan, Cyprus – which were on our side. It would be a clear stab in the back from Serbian side. You want to have friends, still? Who wants to be your friend? No! It will! You will get the monoethnic Kosovo and monoethnic Serbia, with the people less prone to understaning each other, because they did not live with each other. It is not European idea at all. It is better to preserve the multicultural Serbia and Kosovo in their present borders and to negotiate further about cultural and territorial autonomy for respecive minorities. And the Serbs in Kosovo will be much weaker without the North. Perhaps they will move to Central Serbia. A cultural disaster! The Balkans are close to the dangerous point of being transformed into an array of “feudal” nation-states, while slowly degrading any multiculturality and federalism. The local lords are becoming omnipotent in their areas and belligerent towards each other. It is a very anti-European idea and the EU seems to keep mum about it, nodding its head and confirming “that we are on a good path”, which is not good at all. Georgia, Ukraine, Moldova, Azerbaijan, Cyprus – they all were on our side. It would be a clear stab in the back from Serbian side. You want to have friends, still? Who wants to be your friend? Next articleTanja Miščević, Head of Negotiating Team for Serbia’s Accession to EU: We Are Not Giving Up!